Molly likes to play with her cookies, pushing them around, nosing them, chewing a bit here and there, and turning it into quite a project. This is why it takes her so long, and this is why she needs a protected space to enjoy it, because there are certain dogs who would not appreciate the dilly-dallying when it comes to eating something tasty and would swoop in to help themselves. Despite the length of time Molly devotes to this, she always leaves some cookie fragments behind, which blind Millie the Lab discovered quite a while ago. Millie knows when it’s Molly’s cookie time, and she parks herself right outside the crate, waiting to hop inside as soon as we let Molly out. 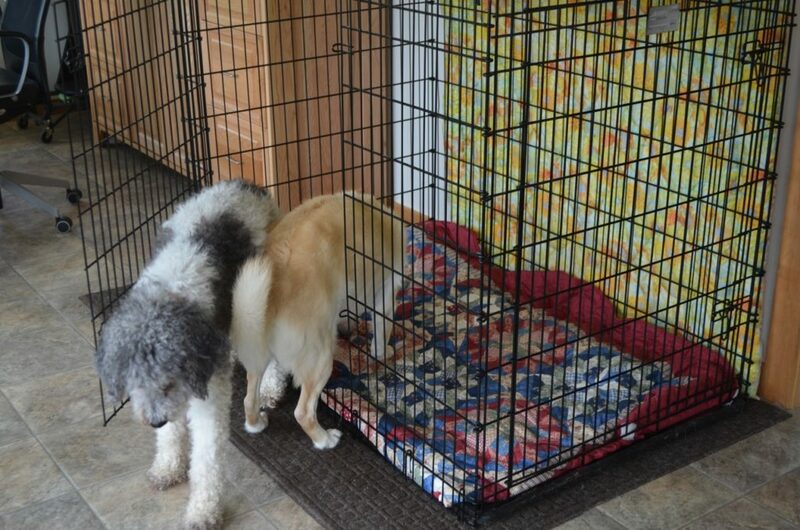 There’s also the chance that Molly will push or drop some cookie pieces through the crate sides. You can see just how close to the edge Molly is with those cookies when I took these photos … so the random “cookie drop” just might happen! In case you’re wondering, yes, Millie gets her own cookie treats in the morning. Also, “Millie” and “Molly” apparently sound identical to Millie, who comes running whenever we call for Molly … though we suspect this has more to do with her anticipating it’s Molly’s cookie time and maybe-just-maybe she can get to the cookies first! Some days there are just crumbs left, other times a good-sized piece of cookie. No matter, Millie believes it is worth the wait! Hilarious!!! I think it’s funny how these rituals happen especially when it usually involves a treat!! I looked at the pictures of your new place. Very nice and homey. OK, that photo is just laugh out loud funny. 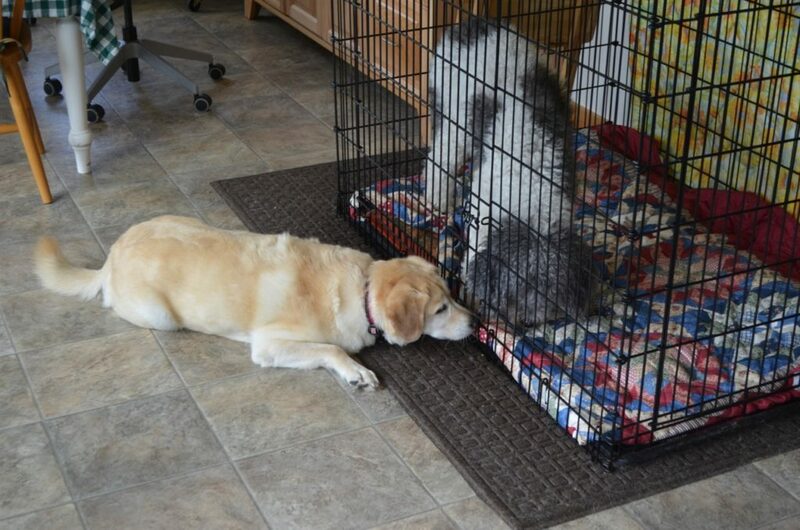 Molly is lucky she doesn’t get knocked over leaving her crate. File Millie and Molly under selective hearing! That’s hilarious! It’s nice to know there’s always a cleanup crew waiting in the wings. Whenever I call one of my dogs, they both come running. FOMO, or, eternal hopefulness. This is so quirky and funny! The patient pooch gets the cookie crumbs and doesn’t mind at all. Way to clean up the kennel girls! Ahhhhhh…….thank you for loving these girls again! Hoo Ha! Always entertaining stories from you all.